I’ve been having a lot of fun riffing on a topic that I’m passionate about… building communities. I hope that you’ve been enjoying it. Communities are funny. Sometimes they can pop up in places that you would have never thought possible. 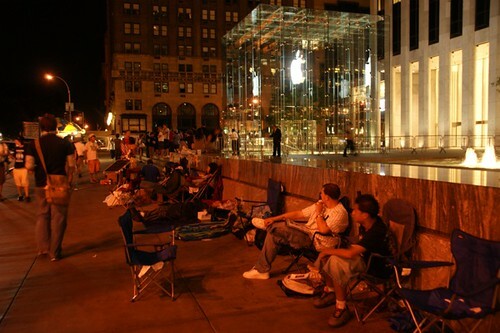 TechCrunch sent their NYC intern to the 5th Avenue Apple Store to cover the line as throngs of people waited for the new iPhone 5. As he was waiting all night long, he asked the question that any rational person would, “why on earth would someone do this for a phone?” The answered was that it’s not about a phone. It’s about community. You’re having this shared experience with like-minded people. It’s the perfect recipe for a community. I remember when I waited in line for the original iPhone. The lines weren’t as crazy as they are now. I cut out of work at noon and only waited 3 hours. But… I walked away from the experience with friends. I still stay in touch with the couple that stood in front of me in line. Apple fans aren’t just people who use computers. It’s people who espouse to a specific way of thinking or way of life. Apple users are creative & curious people. Not many brands can claim this type of tribe. It’s not like if you use a Dell that it says anything about your personality but it’s different with an Apple computer or an iPhone. So… when you get those like-minded people together in a single environment for a shared experience, magic happens. Communities get built out of standing in line to wait for my new iPhone. Previous Previous post: Feel like a lemming.